Beautiful collector quality DEVLIN the lovable Halloween DEVIL 10" from 2000 by TY Attic Treasures. All Attic Treasures have been retired and TY no longer produces this collection. Because of this, Attic Treasures are increasing in value. This bear is in perfect condition with tags, never been played with. It is guaranteed to be authentic, was purchased from an authorized TY dealer, comes from a smoke free home, and has never been displayed. 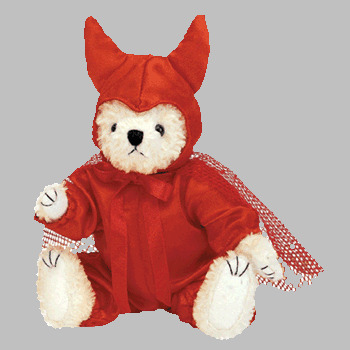 Items Similar To "DEVLIN the DEVIL Halloween Ty Attic Treasure Plush Beanie~NEW"